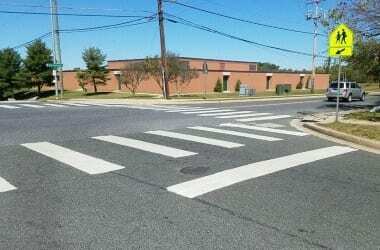 Baltimore County Councilmembers David Marks and Wade Kach announced on Monday that a brick crosswalk would be constructed to improve safety at Pine Grove Middle School. The $25,000 crosswalk will be built by the end of the year at the intersection of Proctor Lane and Old Harford Road. Kristen Piscopo is president of the Perring Park Community Association and a parent of a student at the school. Councilman Marks was a sponsor of the legislation that gave greater flexibility to communities where there is support for traffic calming.